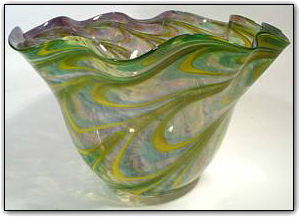 This fluted bowl features lovely shades of green, aquamarine, and yellow on the exterior along with the addition of purple on the interior. The flutes are perfectly formed, and the colorful patterns are absolutely breathtaking as the exterior and interior colors react together. Make sure to zoom in and see the intricate manner in which the colors perfectly and complimentary interact with each other from the outside in and vice-versa. Such a beautiful fluted bowl!